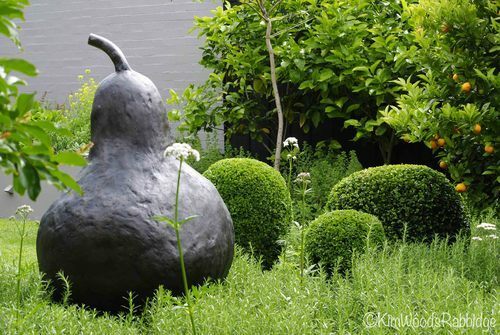 In Lisa Ellis’ beautiful garden, a voluptuous pear from Willie Wildlife Sculptures sits amidst a sea of prostrate rosemary, and is echoed by the rounded forms of buxus. 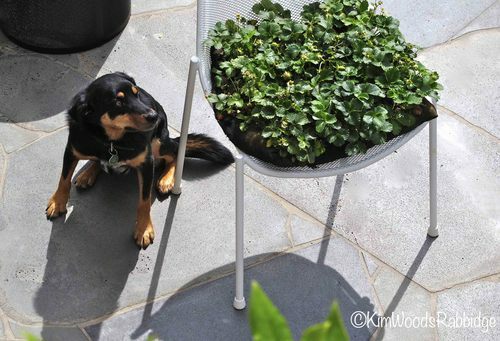 Recently, when the Rotary Club of Kew in Melbourne held its fifth biennial Garden DesignFest, which showcased twenty six professionally designed gardens, the talented Lisa Ellis shared her own, Jack’s Garden, in East Malvern. 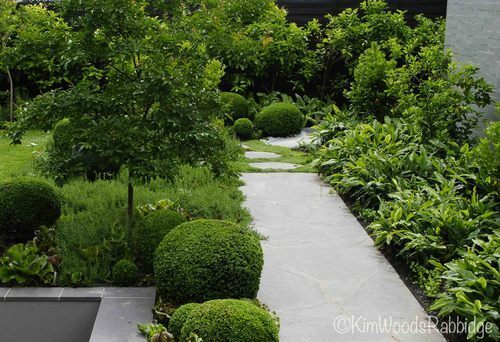 Lisa, when and how were you inspired to be a garden designer? 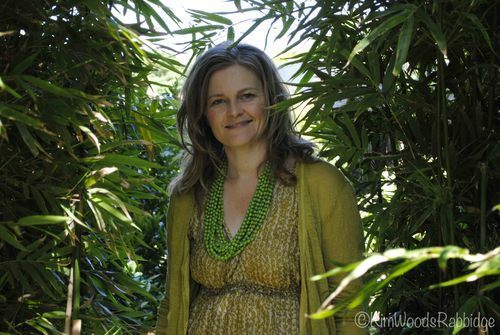 Lisa: One day in 2000, I was standing in Il Giardino di Boboli, Italy and realised I wanted to study garden design. I’d been working in publishing and marketing and after an intensive four year UN project I was burnt out, so went to Florence to learn Italian – and as soon as I returned I enrolled at Burnley College in the Graduate Diploma. 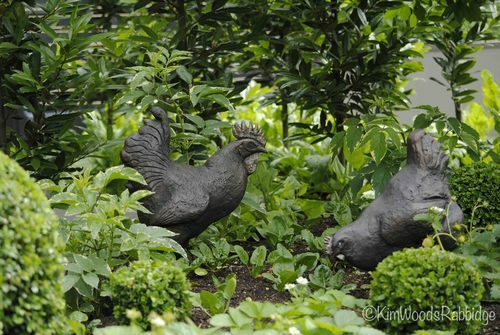 Lisa’s garden is an elegant meld of evergreens and edibles: productive plants and ornamentals. 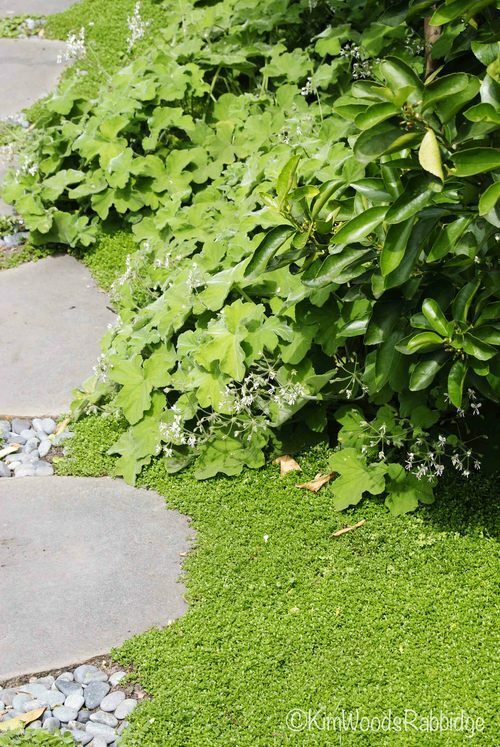 A mat of thyme contrasts with the deeply-lobed leaves of peppermint geranium (Pelagonium tomentosum) along a pathway to the back garden. One of two spaces allocated to courtyards in the compact back garden benefits from the ‘living umbrella’ Lagerstoemia Natchez. In summer the crepe myrtles provide shelter from the west and in autumn they add a lipstick-coloured palette. Eventually jacarandas will provide a feathery canopy without depriving the citrus of sunshine. Lisa: I think we’re shaped by many sources. One of my closest friends is an erudite literary reviewer I met in my twenties who opened my eyes to different interpretations of beauty. Film, literature and music all infuse the designer’s eye in some way. Locally, Lisa Ellis Gardens maintain a number of Rick Eckersley gardens. Rick’s gardens are beautiful in their balance and restraint. It is restraint that is often the hardest discipline of the designer. I am not a great fan of symmetry – living today is not formal. Imperfections in symmetry are far more easily detected. Gardens that are handsome and dramatic, and a little bit daring, (whatever that may be) excite me. In the last few years I’ve designed a number of gardens featuring cloud clipping. 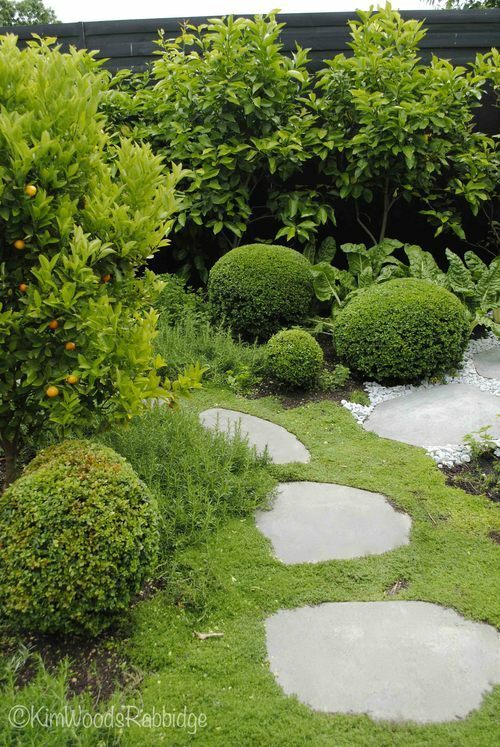 I adore the work of Belgian landscape designer Jacques Wirtz, and also the gardens demonstrating balance and serenity of Spaniard Fernando Caruncho, who’s based near Madrid. Caruncho says that studying philosophy has formed and shaped his garden design as much as the study of landscape architecture. Reading about gardens and garden history, and anthologies on gardening can shape decisions, helping to clarify and resolve challenges. On a humorous note, if you’ve not discovered the gardening books of Beverley Nichols (an original Bright Young Thing – 1920s London) then you have much to look forward to! Sorrel makes a good evergreen perennial border beneath the bay trees. Lisa recommends trying the sorrel soup recipe in Elizabeth David’s cookbook. The western courtyard, screened by a hedge of bay trees, is a private space for Lisa’s eighteen year old stepson and his friends. OAG: What were the constrictions in doing Jack’s garden – why the final layout? 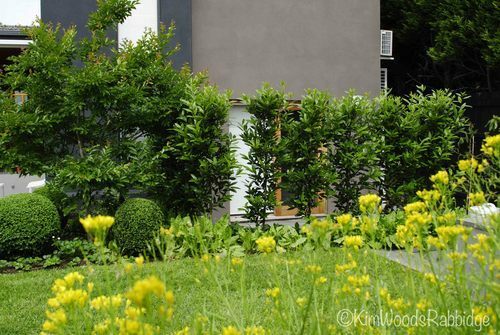 Lisa: In 2010 we moved into this renovated 1960s house but had no intention of tackling the garden so soon. Major flooding in February 2011 changed that. We had to excavate and relay the entire water system, and we removed more than eighty cubic metres of soil from the back garden, which is not terribly large. 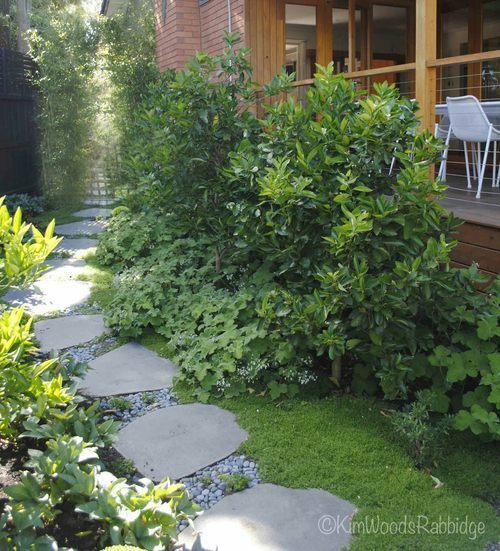 The garden was designed on different levels to create enough fall for storm water without the need for pits and sump pumps. 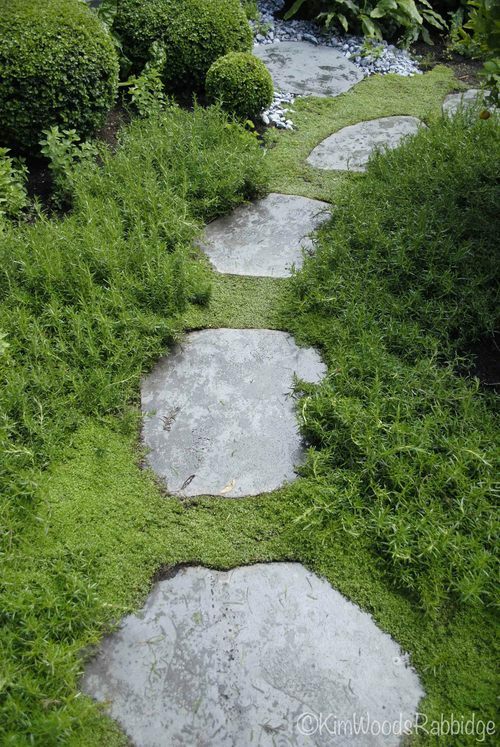 Prostrate rosemary and thyme surround bluestone pavers. “When we received the palettes of bluestone, every piece of ‘random’ bluestone had two straight edges so the team used angle grinders to round them – a labour intensive addition. The best crazy paving is organic and rounded, with pieces slotting in like a complex jigsaw puzzle. As well as getting the garden ready for the DesignFest, Theo and I were married here in April 2012 – only six months after planting – so thank you Seasol and Powerfeed!” Lisa exclaims. Jack eyes off the strawberry cushion. Lisa: I like naming gardens after pets I adore. It was to be called Archie’s Garden but my recalcitrant tri-coloured Corgi passed away in 2011. ‘Jack’ is our new kelpi from the lost dog’s home. He’s a gentle soul except when he hasn’t been exercised, then he runs through the siverbeet as if he’s surfing sheep backs in dog trials. 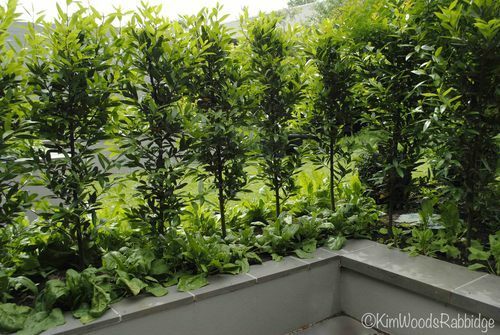 The ’orchard’ includes Imperial mandarins and cumquats; and Washington navels used for screening between the neighbours; Lisbon and Eureka lemons are pleached on the rear fenceline; and Tahitian limes are planted close to the elevated back deck – no shortage of citrus! “The huge number of cooking books I collected when working in publishing has come in handy as we enjoy the bounty of the garden. Over the first twelve months we collected more than 120 kilograms of lemons and in excess of 40kg of limes. Theo’s so far made five batches of marmalade; our weekends are productive,” Lisa notes. 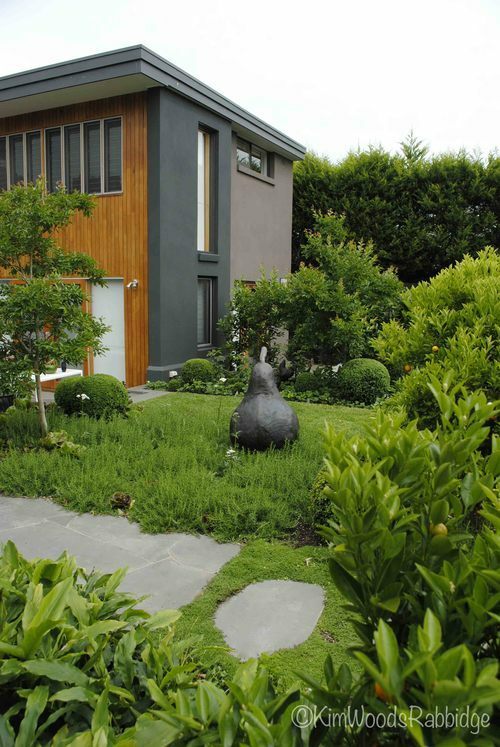 OAG: What are the favourite elements in your own garden? 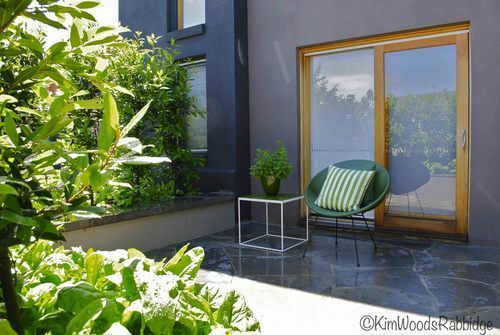 Lisa: The drama in Jack’s Garden created by the black fences, (Colourbond Nightsky) and the cloud clipping are two elements that bring cohesion. 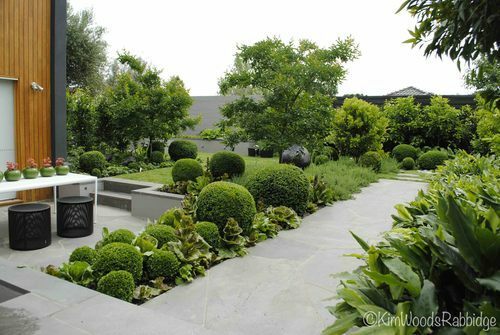 The serenity of the Buxus sempervirens ‘Suffruiticosa’ (Dutch box) is paradoxically uplifting and grounding at the same time. 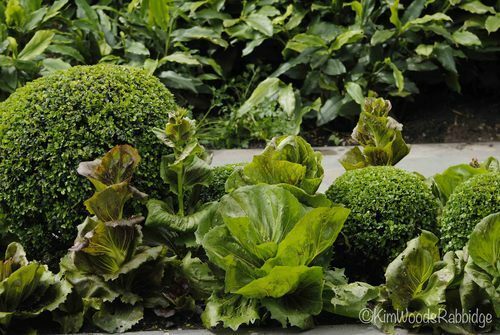 Growing plants for foliage, form and culinary use interests me a great deal more than flowers. I’ll happily grow flowers for scent and vases but my ‘must have’ floral palette is one tenth the size it used to be. My favourite flower is the gardenia – it reminds me of my grandmother. 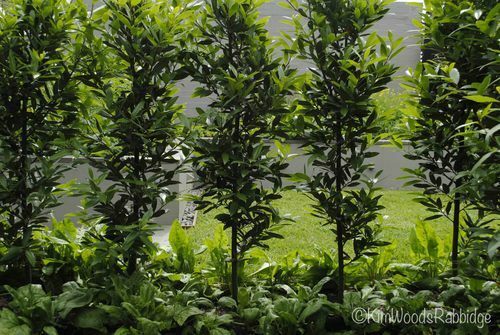 The lushness and many shades of green appeal most. Apparently our human eye can detect 16,000 shades of green – it’s more sensitive to green than any other colour. My favourite colour has always been green. 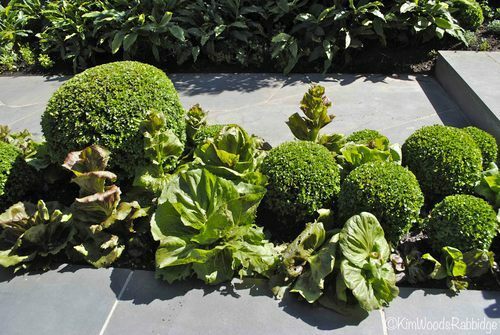 Textural feast: when the Radicchio is finished, and more seedlings are planted, the buxus maintains its form. 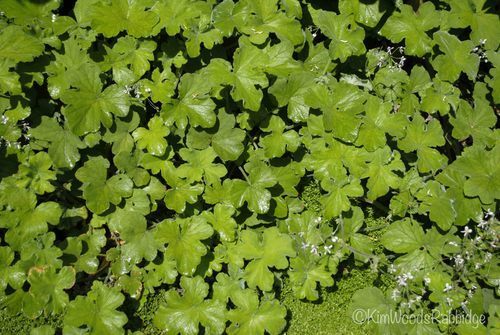 On the right, false cardamon, (Elettaria cardamomum) creates a lush border. It’s aromatic and especially useful to line a baking dish when cooking fish. 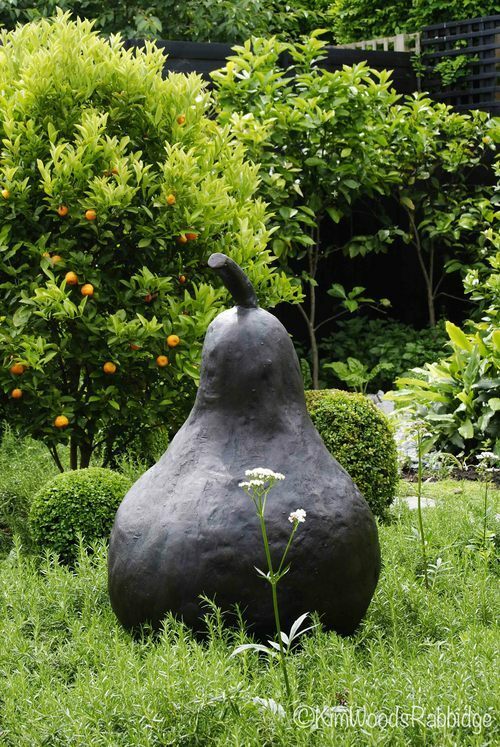 Over the DesignFest weekend innumerable visitors enjoyed the clever, fresh garden design, and punctuation points such as the sculptured bronze pear. 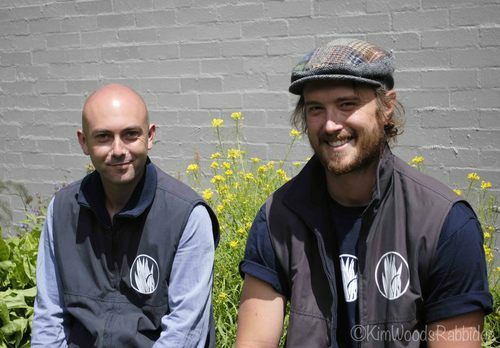 Lisa Ellis Gardens team members Floyd Bassett and Stuart Fahey were in the garden to answer visitors’ questions. 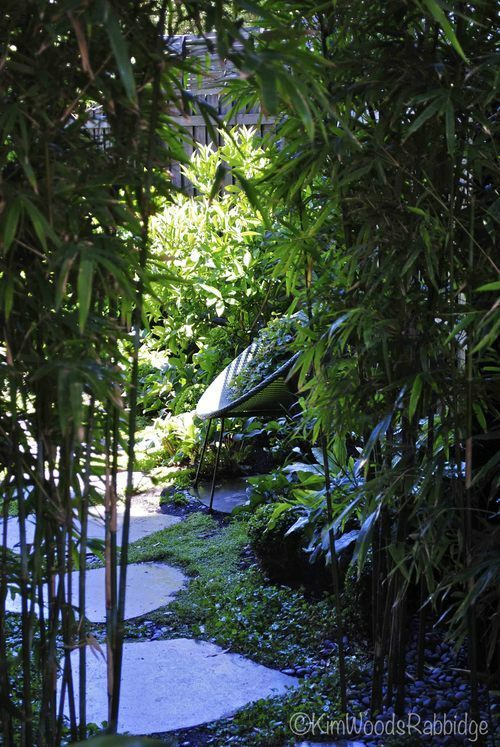 Bamboo textilis ‘Gracilis’ flanks the entrance to the private back garden; a surprising place of abundance, beauty and tranquility. Just checked out your blog. The pics are superb – I love the way you handle light. 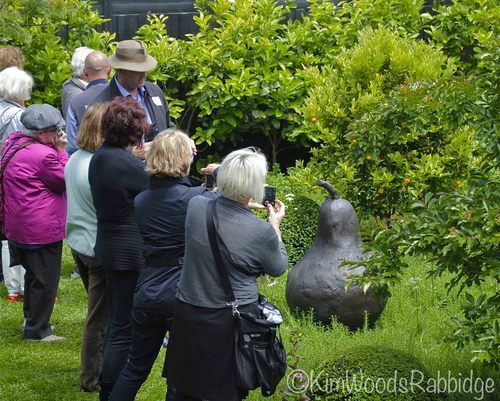 I love the idea of a collective celebration of Australian gardens, embracing their diversity. OAG: Michael McCoy is The Gardenist – you’ll find a link to his blog on the side.